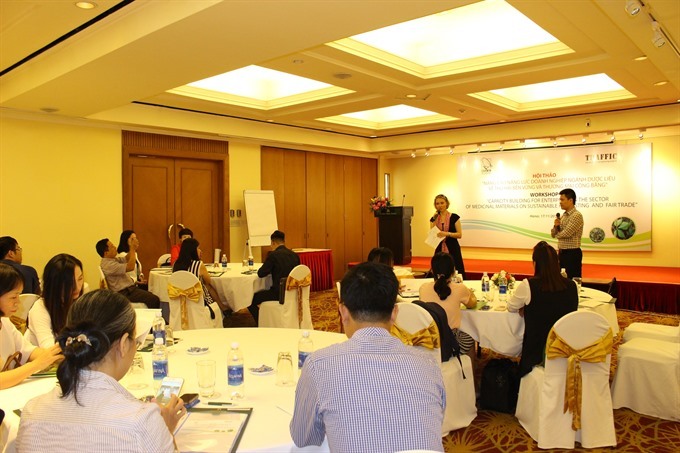 HCM CITY — Representatives from twenty five traditional medicine and pharmaceutical producers joined a workshop last Friday in Hà Nội, focusing on promoting sustainable harvesting and fair trade practices as part of their corporate social responsibility (CSR) in particular through the application of the FairWild Standard. The workshop gave attendees a greater understanding of how medicinal and aromatic plants are harvested, processed and traded. The event included sessions on CSR opportunities related to sustainable plant collection and environmental protection where the FairWild Standard was introduced as the beneficial model to underpin such efforts. The FairWild Standard is an internationally recognised best practice framework, developed by a number of organisations, including the UK-based Wildlife Trade Monitoring Network (TRAFFIC), to verify the sustainable and equitable trade in wild plants, fungi and lichen. FairWild also provides third-party certification so that consumers can be given assurance that their product has been sourced using sustainable methods. Attendees were given guidance on the legislation surrounding plant harvesting and on the importance of safeguarding plants for the use of future generations. Community development was also a major topic of discussion, with speakers emphasising how fairer trade practices resulted in higher living standards for the harvesting communities and contributed to a more consistent, better quality product. “There is a tremendous opportunity here for companies to establish fairer trading practices, build capacity and enhance livelihoods in the communities that provide them with the ingredients for their products,” said Madelon Willemsen, Head of TRAFFIC’s Việt Nam office.